Minnesota is home to the world's largest hockey stick and the world's largest ball of twine. This week it will become the temporary home of the world's largest string instrument. The "Earth Harp" is being assembled in downtown St. Paul as part of the Flint Hills International Children's Festival. 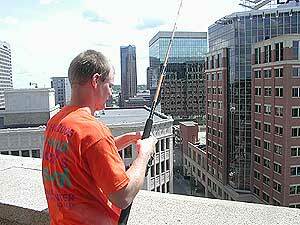 St. Paul, Minn. — It was kind of strange to stand in the tower of St. Paul's Landmark Center and watch a workman take a fishing rod with a tennis ball as a plug, and cast a shimmering brass line down to the street below. He was actually stringing the Earth Harp. To get an image, picture the Landmark Center and the ground as the wooden part of a giant harp, the biggest you've ever seen. Bill Close, its inventor, describes its enormous dimensions. "The strings are roughly about 400 feet long," he says. "And they go from a tower up here all the way down to a main plaza area." Close is referring to Landmark Plaza, where he and his team have built what he calls a bridge resonator. Close to two dozen strings are attached to the resonator, which captures their vibrations and turns them into music. "The way the instrument is played is we wear rosin gloves," Close says. "So, gloves that have rosin, which is the same stuff that goes on a violin bow. And we run our hands along the strings. We don't pluck them, but rather run them along the strings. It produces this beautiful cello-like tone. It sounds a lot like cello, a lot like bowed bass. It's more of a bowed sound than a plucked sound." Bill Close is artistic director of the MASS Ensemble, a company he founded in Malibu. MASS stands for Music, Architecture and Sonic Sculpture. MASS has installed and played earth harps in natural and urban environments across the country. Close is inspired by the massively scaled outdoor art of Christo -- the artist who has wrapped entire buildings and sometimes even landscapes. Close says he invented the Earth Harp to free peoples' minds on the subject of music and how it's created. "One of the things is just the aspect of imagination and pushing peoples' idea of what is a musical instrument, and how to envision anything on a large scale," says Close. The Earth Harp is so big the act of playing it looks like a dance, which is why The MASS Ensemble has turned it into a somewhat choreographed performance. It's also designed to be interactive, which means the public will get a chance to play it too. Close's wife Andrea Brooke is one of the group's musicians. Brooke says audience reaction to the Earth Harp around the country has been pretty similar. "Eyes get enormous, mouth drops open, and they're like, 'Oh my God! That sound is coming from that.'" Brooke says it's not difficult to play the Earth Harp, but musicians need a subtle touch. "If you play the strings too roughly, then the sound is too harsh, and not very pleasant to listen to," says Brooke. "And so there's a quality to the way you play the strings that is gentle and nurturing." Brooke says there's a message there. She says the essence of the Earth Harp is stringing a piece of the earth and allowing its tone to come forth. She says when that's done in a gentle nurturing way, the musician and the earth have an opportunity to make beautiful music together. The Earth Harp will remain in Landmark Plaza for the duration of the Flint Hills International Children's Festival, through June 5.